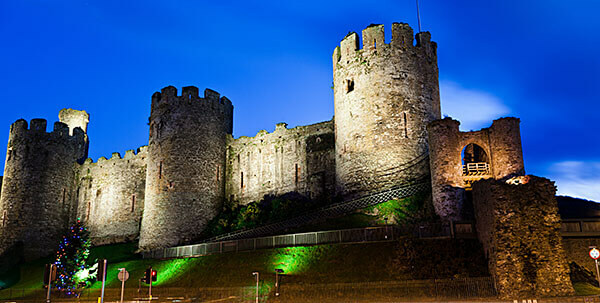 Conwy Castle is a true testament to the magnificence of the medieval kings of old. It was built by Edward I and was one of his “iron ring” of castles. The “iron ring” consisted of Conwy Castle, Ruthin Castle, Caernarfon Castle, Beaumans Castle and Harlech Castle. They were built to as a sign of strength in hopes that they would help quell the Welsh uprisings. It was the most expensive Welsh castle built by Edward I and took six years to build. Master mason James of St. George oversaw the construction of Conwy and the others. This castle has seen rebellions, uprisings and the English Civil War. By the 17th century, the castle has been pretty much abandoned and left to ruin. With the English Civil War, Conwy Castle garrisoned by the king, once again. Today, Conwy Castle is a scheduled Ancient Monument and part of the World Heritage site called “Castle and Town Walls of King Edward in Gwynedd.” It is managed and maintained by Cawd, along with several other castles in Wales. It has grown to be one of the biggest tourist attractions and most visited in North Wales. It remaines one of Wales' best preserved castles. Although the old buildings are almost entirely gone, the town walls remain pretty much intact. Open daily to visitors, it is definitely a magnificent site. Conwy Castle towers over the small town of Conwy, in North Wales. You can't miss it when visiting the town. Last updated by Heathr Rudebusch on 07 January, 2013 in Destinations.